Kent Monkman has curated a winner. His second touring solo exhibition – now at Montreal’s McCord Museum until May 5 – is titled Shame and Prejudice: A Story of Resilience, and illuminates Canadian history from New France to today. And what a revelation it is. Thanks to the show’s narrator and guiding light, the fictitious Miss Chief Eagle Testickle (a word play on “mischief egotistical”), who is a time-travelling, shape-shifting, gender-fluid alter ego of the Cree artist. 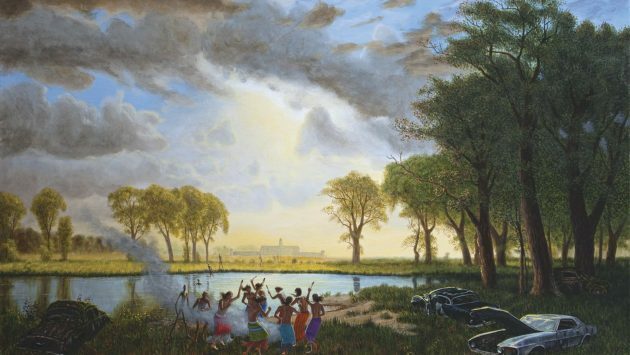 Monkman’s exhibit features his paintings, installations and sculptures. They are steeped in the artistic tradition of the European masters, like Caravaggio, and inspired by the experiences of Indigenous America. His works are juxtaposed with original and traditional artifacts from various museums and collections to provide the show with historical gravitas. Shame and Prejudice highlights some of the tragic events and genocidal policies that have affected Canada’s Indigenous peoples since the European arrival. The spread of diseases brought by the settlers; the systematic decimation of bison, a major food source; and the introduction of the reserve and residential-school systems. While the driving force behind the show is serious, Monkman cleverly incorporates campy humour – thanks to the presence of Miss Chief Eagle Testickle – to counterbalance the earnestness of the subject matter. Shame and Prejudice is broken down into nine thematic chapters that cover over 350 years of European contact: 1) New France, Reign of the Beaver; 2) Fathers of Confederation; 3) Wards of the State / The Indian Problem; 4) Starvation; 5) Forcible Transfer of Children; 6) Incarceration; 7) The Res House; 8) Sickness and Healing; and 9) Urban Rez. As you move through the exhibit, each chapter is introduced by a passage from the narrator’s booklet Excerpts from the Memoirs of Miss Chief Eagle Testickle, written in Cree, French and English. As you enter the room housing Chapter 5, Monkman greets the viewer with a solid body punch. A large tableau painting, “The Scream”, dominates the space. It is a gut-wrenching depiction of the forcible removal of children from a community. 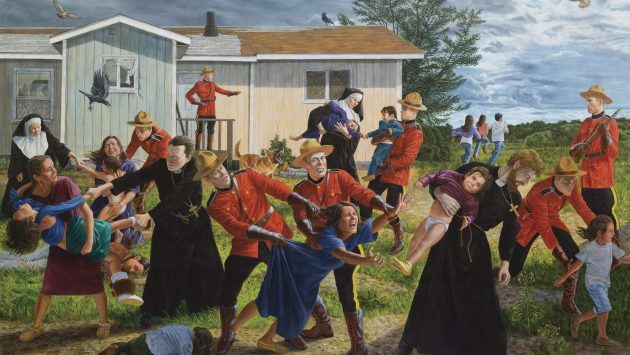 Participating in the removal are seven RCMP officers dressed in their red tunics along with four church figures – two priests and two nuns – who are violently wresting the children from the hands of their distraught mothers. In the centre is a screaming mother whose hair and dress are being pulled by RCMP officers as she desperately reaches out for her son who is being carried away by a priest. This harrowing image is more haunting in that the painting is flanked by 20 brackets and outlines for cradleboards to be mounted. However, only seven are on display. The beauty and intricacy of these seven crafted boards remind the viewer of the love these children had in their families and communities. Their removal was devastating and destructive – an act of pure evil. Kent Monkman, The Scream, 2017. Acrylic on canvas. Collection of the Denver Art Museum, Native Arts acquisition fund. Kent Monkman, Nativity Scene, 2017. Mixed Media Installation. Gift of the Volunteer Committee to Museum London (1956-2017), in memory of Shelagh Martin-McLaren, 2017. 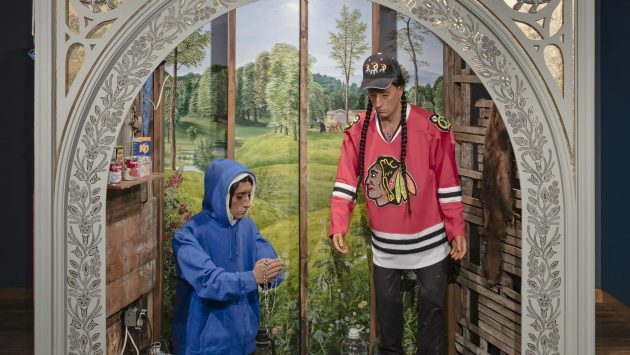 Besides large-format paintings, Monkman’s exhibit includes several intriguing installations. The Nativity Scene dominates the Res House chapter. Besides highlighting the substandard living conditions found in many communities, the installation also underlines the lasting impact of Christianity on Indigenous peoples. Two individuals – one standing, the other kneeing and praying with a rosary – look down at the naked infant lying on a Hudson’s Bay blanket inside a dilapidated house. The wooden wall studs are exposed, and a piece of blue tarp covers a hole. The person standing upright wears a brand-new Chicago Blackhawks jersey, while the kneeling character sports a blue hoodie, striped Adidas pants and fancy new sneakers. Their clothing is in direct contrast to the rundown interior of their home with its single coil burner, kerosene lamp and red plastic gas can. In the back are two large containers of Nestle Pure Life bottled water. Monkman is a master of detail. All the food items bear handwritten price tags – a 2-litre bottle of Coke $12.45; Kraft Dinner $11.42; Heinz Baked Beans $16.19; and the price for a box of eight jars of baby food reads $55.29. The Shame and Prejudice exhibit is a stunning and engaging statement that honours the resilience of Indigenous peoples of Canada.